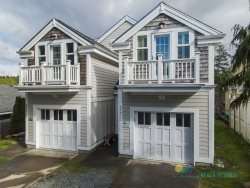 Spend your vacation days on the Northern Oregon Coast in comfort when you stay at this beautiful Manzanita beach Townhome! Both units can be rented if needing accommodations for up to sixteen people or individually for eight occupancy on each side. Located one block up from Manzanita's seven-mile stretch of beach and a ten minute walk to downtown, this townhome makes it easy to explore the area's attractions. The edge of Nehalem Bay State Park is less than a 10 minute walk from your front door and offers hiking, biking, and equestrian trails, as well as beachcombing, fishing, and kayaking. Life's a Beach offers a tri-level floor plan with four bedrooms and two and a half baths. There are two bedrooms on the top floor, the queen master offers an en-suite master bath with shower and double vanity. The other bedroom has twin bunks for the kids. The bottom level offers a king bedroom and a queen bedroom. In between the bedrooms is a full bathroom with tub/shower and double vanity. The washer and dryer is also located in this bathroom. All mattresses/furniture in this home are brand new and very comfortable. The newly stocked kitchen comes fully equipped for that chef in the family. Some of the new finishes include stainless steel appliances and granite countertops. The overhang on the kitchen counters allows for 3 bar stools. Just around the corner from the kitchen is the large dining table with seating for up to eight. There is a sliding glass door that leads to the back deck. The deck overlooks a forest type area. Bring along your Netflix account information and stream a movie on the flat screen TV in the cozy living room for a fun night. There are games, toys and books in the living room as well. The living room is located about seven steps up from the kitchen area and a great place to curl up with a good book on a blustery day. The garage is a place to keep your bikes, beach toys or anything else you don't want left outside. We keep the BBQ in the garage as well. No smoking of any kind are allowed on or in the property. Two dogs are allowed in this home. Don't wait - start planning your Northern Oregon Coast getaway today! Up to 2 dogs max, must be at least 2 years of age, and flea treated. No cats allowed. Awesome place. Great location, privacy for extended family, close to fun activities and destinations. Highly recommend. Lots of nature and wildlife, saw 3 deer on a neighbor's front lawn. ***** Definitely a 5 star !! !